LiveSite est une application de création de site Web gratuit et de gestion de contenu. Une version commerciale est également disponible. Image Optimization - The speed at which your web pages load impacts the usability and success of your website. liveSite now has a built in image optimization feature to quickly compress any image file without losing it's quality. You can optimize images one at a time, or select several images at a time. You can optimize images you already uploaded in a previous versions of liveSite too so you can see instant improvement of your existing website performance. Real-Time Shipping Rates & Containers - liveSite can now request the shipping rates from UPS and USPS and present exact shipping fees instantly to your customers during checkout. This feature can help lower shipping costs for your customers which in turn will improve conversions as well as help you manage your shipping costs more closely. Containers are used to ship more than one product for delivery to a recipient. Containers are used to lower the cost of shipping and handling by organizing multiple products in the same shipping Container. Protected Shipping Methods - If you handle catalog orders by phone, fax, or postal mail, your internal sales reps may need shipping methods that can only be seen and selected by them so they can submit orders on behalf of your offline customers. This allows you to use real-time rates for your online customers and predefined shipping rates for your mail order customers. Protected Shipping Methods can also be used to submit special orders that require unique shipping methods that you may not want all customers to have access too. Seasonal Catalogs - liveSite can now be setup to manage seasonal catalogs. For many gift-giving shopping sites, it's important to have the ability to quickly enable and disable catalogs, product groups, and even individual products so customers and phone order reps all have real-time access to the currently available products for purchase. Product Groups and Products can now be quickly enabled and disabled to make this process easier throughout the year. Commerce Management Improvements - Commerce Managers can now be assigned privileges to only view Order Reports and the Shipping Report without access to change Products, Offers, or other Commerce features. This is ideal for your sales and management teams that want real-time information on order data and shipments but don't want to accidentally mess up your online store presentation. Starter Theme Updates - We have improved the default starter theme that comes with each new liveSite. We have separated the fonts and colors for menus, buttons, headings, and text so you can mix and match them to created thousands of variations of the default theme quickly with little effort. 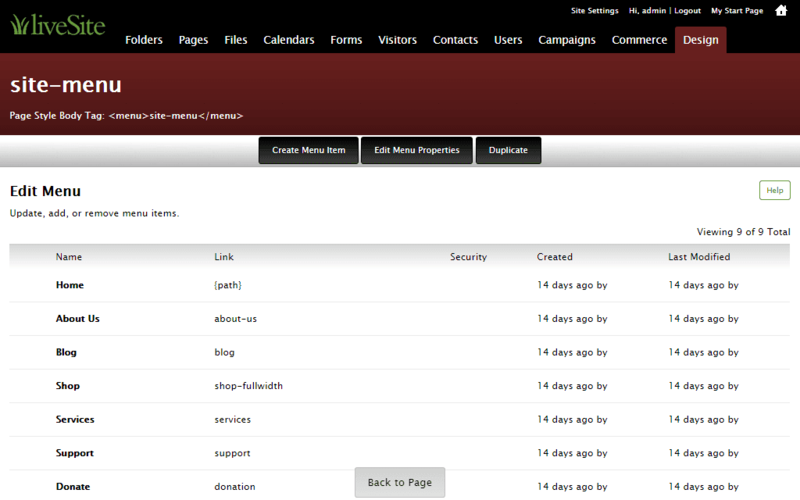 Page Style Collections - Page Style Collections now can control Form List View / Form Item View Page Layouts. Now different View Layouts can be assigned to the Active Theme and the Previewed Theme at the same time. This allows Designers to redesign Form List / Form Item View Pages without affecting the original production pages. SEO Improvements - Google Universal Analytics is now embedded into every liveSite page. Universal Analytics library introduces a set of features that change the way data is collected and organized in your Analytics account, so you can get a better understanding of how users interact with your liveSite content. UI Improvements - liveSite now uses your browser's build in features to validate form fields for a better user experience for your site visitors. The built-in CAPTCHA feature has also been simplified to make it easier for your site visitors to submit forms which will lead to better conversions. Help Docs - liveSite context-sensitive help is now integrated into livesite.com so it's easier for you to read, search, and browse on any device. Each new version of changes are now also annotated. Performance - We improved the overall performance of liveSite as we have been adding features and this release is the fastest liveSite version yet. Site Log - The Site Log has been expanded to show more details regarding liveSite processes including Email Campaigns, Payment Processing, and Shipping Containers. 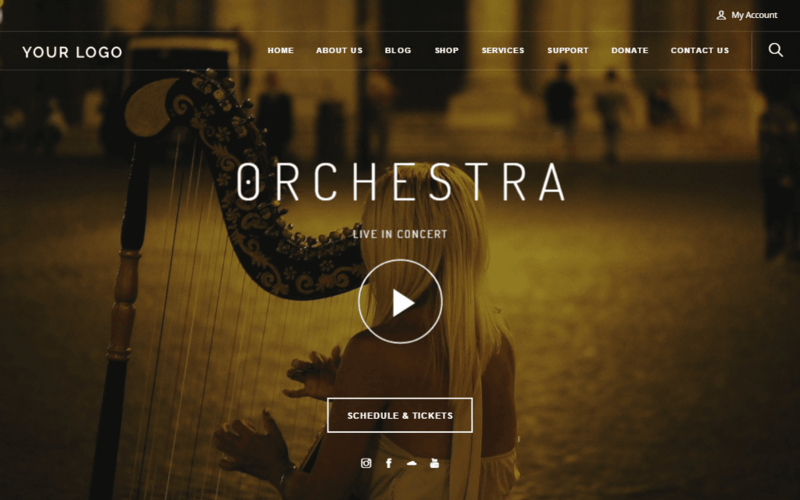 New Website Templates & Themes: We have expanded our collection of complete website templates that are installed with each new liveSite. 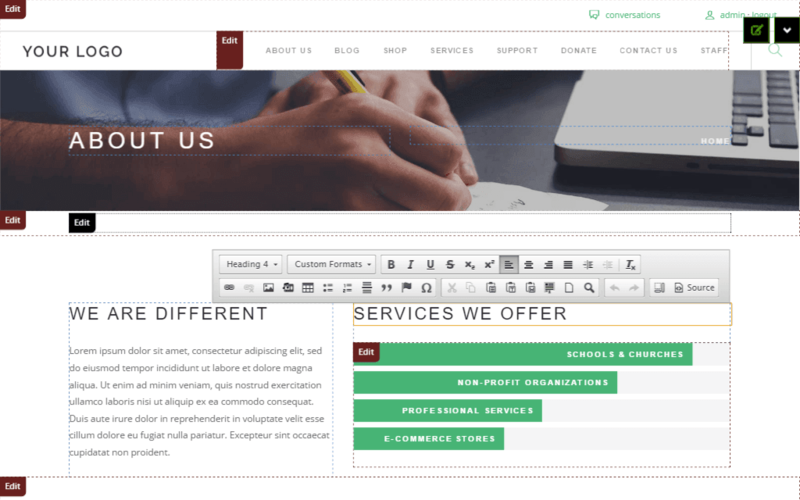 The original starter site template is now called "Full" and perfect for larger organizations that need to enable many of the features of liveSite. 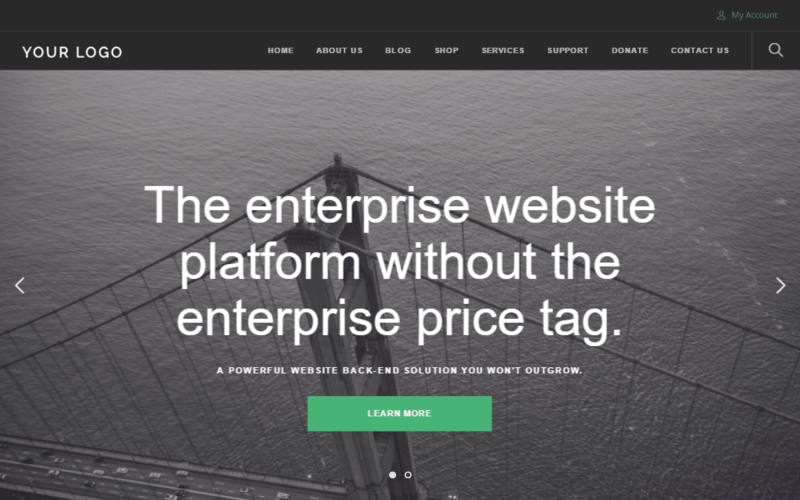 There is now a new smaller "Startup" site template that is perfect for small organizations that need to have a presence online and gather and manage website leads. 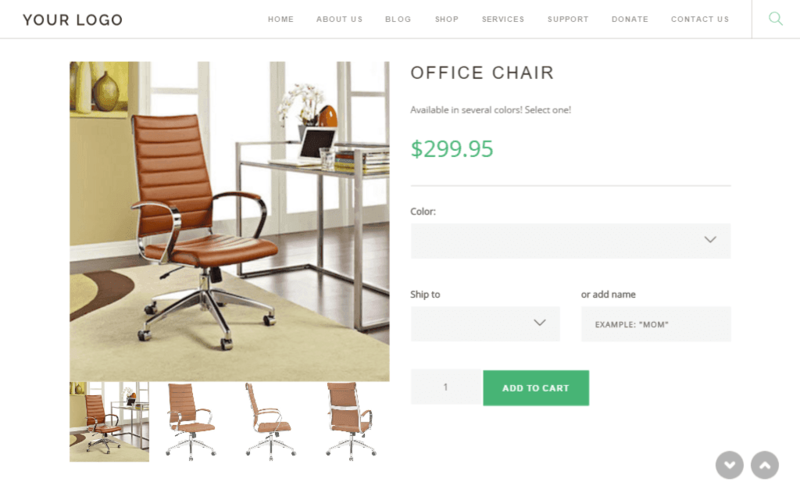 For those that need a site focused on e-commerce catalog shopping, we created a new "Shopper" site template. Each of the new website templates include a fully-responsive front-end design to get you started but you can easily import your own designs and extend the functionality for your specific needs. New Sandbox Sites: To mirror the new Website Templates & Themes, we created three new Sandbox Sites that you can use as a reference for your own liveSite build-out, examine how to create fully-responsive front-end designs, or simply try out new things before you apply them to your own liveSite. HTML 5 and UTF-8 Support: HTML 5 and UTF-8 are now the de facto standards in front-end web design, so liveSite now fully supports these standards from beginning to end. Handling international language characters as well as custom font and icon sets are now supported. Page Designer: Web designers can quickly edit their html, css, and js files, content, and preview their changes instantly across many devices. Manage any responsive front-end design from within liveSite without FTPing files back and forth or purchasing other site development tools. With liveSite and a modern browser, you'll have everything you need. Website Import: Save tons of time by importing any web site into liveSite so you can quickly begin using the benefits of liveSite's powerful back-end features. liveSite's powerful new import feature will grab all the photos, code files, HTML, and content from any website, upload all the files, create the proper liveSite objects, and link them together for you. Zip File Import: Since your new liveSite website design might be in the form of a template you download from a third-party theme site, liveSite also supports a website import from a single zip file. Even if not a design, the zip file import will quickly upload and unpack your compressed files too. Page Region Collections: As you develop a new front-end design on top of your existing production liveSite web pages, your current page content may not fit nicely within your new design, or you may simply want to replace the existing page content with new content altogether. Page Region Collections have been added to all Custom Page Styles so you now have the freedom to redesign your page content alongside your new page designs. Conditional Page Content: As a web designer, many times you'll need to hide or change sections of a web page based on each site visitor's level of access at the moment. and  are powerful new tags that conditionally display or hide content, code, and even liveSite Regions depending upon who is viewing the page. Keyboard Shortcuts: We added some keyboard shortcuts to the liveSite Control Panel to make it faster to move around and make updates. When viewing a page, Ctrl+D (or Command+D) will toggle Fullscreen Mode, Ctrl+E (or Command+E) will toggle Edit Mode, and Ctrl+G (or Command+G) will toggle Page Designer. In addition, if you are editing page regions or a control panel edit screen, you can also use Ctrl+S (or Command+S) to save the page or screen changes. Product Attributes: Need to provide product options to your customers as they shop your online store? Now you can. Say you sell t-shirts that are available in several sizes and colors. Any number of options can be presented to your customers as they add products to their shopping cart. Product prices, photos, and details are updated instantly as your customers make selections. Product Catalog Management: There are times when you need a faster way to duplicate one or more Product Groups and/or Products in your catalog. You might want to duplicate a section of your catalog to create a similar section. You might want to back up your current catalog before making extensive changes, or you might want to swap out your entire catalog for another if your catalogs are seasonal in nature. In addition, you can now also mass-enable or disable products all at one time from the all products screen whenever that situation is necessary. Custom Billing Fields: If you need your customers to enter additional billing information, new optional fields can be displayed whenever billing information is requested for an order. Users can also select whether or not they want their contact information updated when they place an order. Variable Shipping Rates: You can now set variable base rates for any Shipping Method based on each recipient's subtotal amount. This feature allows you to reward customers that send more products to each recipient (free or reduced shipping on portions of a larger order). Shipping Date Adjustment: Due to the nature of gift giving during major holidays, shipments tend to bunch up around specific departure dates, overloading docks and fulfillment teams. liveSite now has a unique feature that allows you to spread out shipment dates based on destination zip codes, while still making sure all packages arrive on time. Shipping Report: Now your store managers can view the shipped products as well as unshipped products to get a better picture of past inventory levels and product sales trends. ShipWorks: liveSite now updates its own order information with tracking numbers and shipped quantities from ShipWorks so your customers can login into liveSite and find the updated status of their orders. Custom Forms: You can now automatically grant access to any protected area of your website (Private Folder) when a Custom Form is submitted. This opens new possibilities for developing multi-level membership sites that may not require purchases. Improved Meta Data: Updated HTML meta data content-type content for Form List Views so Facebook and other social networking sites will always display text correctly and improve RSS reader support. Attachment Listing: A new tag has been added to Form List/Item View pages so that all comment attachments can now be listed in one place. This is helpful if you have a Form List or Item View that has many comments and attachments and you want them all to be listed in a single location on your pages. Calendars: We have improved Calendar Events so that they can now repeat daily or only certain days of the week. We also now allow you to hide the start and end times for calendar events on your calendar pages. Auto-Registration: Want to increase your orders and custom form submissions by allowing your site visitors to skip the site registration/login step? You can set auto-registration for any Custom Form or Order Preview/Order Express Page and liveSite will determine if the submitter is already a user or not and either tie the submission to their user account, or create a new user account for them after the submission occurs. Conditional Start Page: A specific User Start Page can now be set as a click-thru value. So as a web designer, you can specify where each user is redirected to within your site each time they login based on how they originally navigated to your registration page. User Time Zones: Your users can now set their own personal time zone in their account profile, and all time and date information is converted and displayed to them in their own time zone.